June | 2013 | Another Beautiful Day in Paradise! The headline in today’s local paper reads “Publisher drops Deen cookbook.” “The Perils of Paula” has been all anyone in Savannah has been talking about for the past ten days. In case you have been hibernating, you know that local Savannah restaurateur-made rich-and-famous Paula Deen has been under attack ever since the contents of a deposition were made public, in which she admitted using the “N-word” some 30years ago. I am of two minds on this issue. My first reaction was this was an incredibly disproportionate reaction to a three-decade old petty misdemeanor. I mean – come on! Let he who is without sin, cast the first stone. I am not condoning the utterance. I just think this is a case of capital punishment for a parking ticket. I feel sorry for Paula. She actually lives around the corner from us, and occasionally we’ll see her shopping in Publix. On the other hand, to borrow another cliché, “Those who live by the sword, die by the sword.” In this case, the sword is the combination of publicity and image. Paula built her food empire and her fortune based on image and publicity. It’s not like she is the greatest chef in the world. Her folksy “Southern charm” made her the queen of The Food Network. Once she caught on, her momentum just kept building. But that kind of fame and image can be like a balloon – big and voluminous, but of little of substance. One leak and the whole thing disappears. Paula did not do a good job protecting that balloon from lurkers with needles. The damning deposition originates in a lawsuit related to a restaurant Paula created for her brother, Bubba. We know a number of people who have worked at “Uncle Bubba’s,” and they tell us that things were run pretty loose there. I have no idea of there is any merit to the actual lawsuit filed by one of Bubba’s former managers, but it is safe to say that the operation was not squeaky clean. 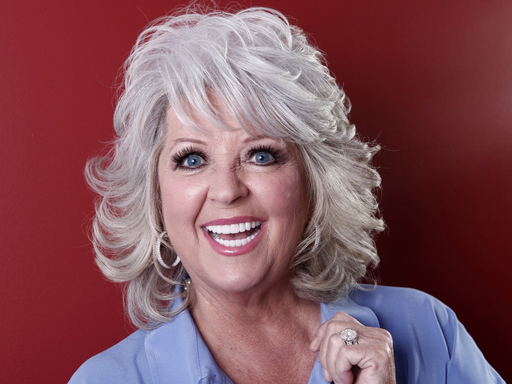 That is not unusual for restaurants, and in most cases, it doesn’t matter — unless you are Paula Deen and you have a mega-million business riding almost entirely on your image. You must make certain there is no one lurking in the background with a hat pin looking to burst that giant balloon. Apparently, she did not do that, and that is her biggest mistake. Too bad. It’s a Sunday afternoon and a pretty good end to a vacation week. I’m sitting on our patio, under the oak tree by our pool, just enjoying a quiet summer Sunday afternoon. The last three days of our vacation were uneventful. 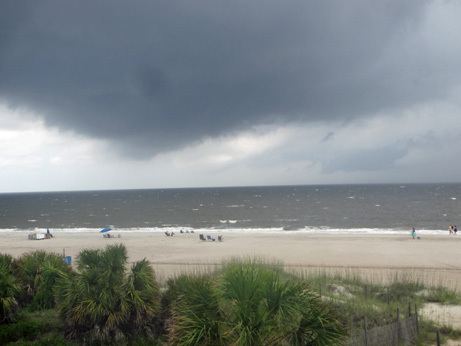 The weather was not ideal, generally cloudy and windy, with a few sprinkles. This was a typical scene from our deck. Mrs. Poolman and I had a very nice anniversary (37th, thank you very much) dinner at one of our favorite restaurants, The Sundae Café. I had their Cajun shrimp and grits, and Mrs. P enjoyed lobster mac & cheese with broiled sea scallops. We enjoyed it so much, we went back for lunch the next day. Decadent, but hey, we’re on vacation. 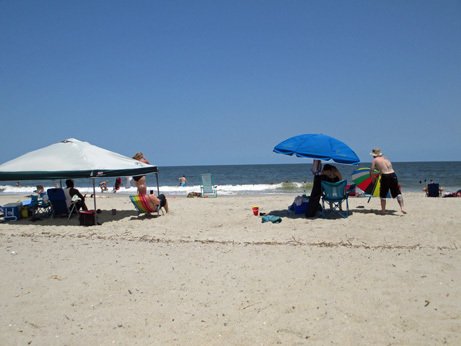 The weather cleared up some on Friday and we got back out to the beach. But even on the cloudy days, we were totally happy just sitting on our deck with books in our laps. Enforced idleness is not bad. We started moving stuff back to our house on Friday because I needed to be out the door early on Saturday morning. I didn’t want to leave Mrs. P with more of a load to move out than her own clothes and some of the leftover food. 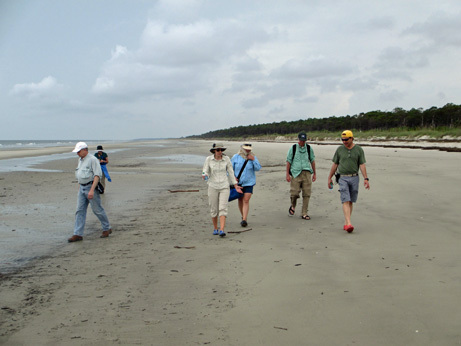 On Saturday, I needed to assist my boss and his wife to take two couples on a visit to Wassaw Island one of our boat-access-only barrier islands. One of the couples had “won” the trip in a silent auction that was part of a major fund-raiser gala for the University System of Georgia Foundation. 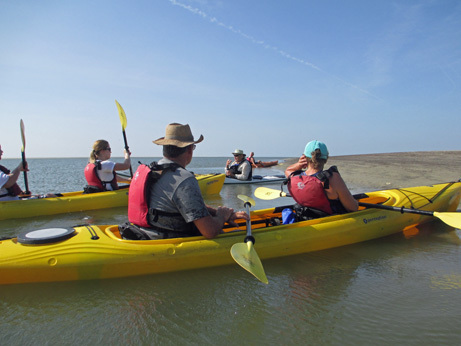 We met up with them at 9 am and drove them to the south end of our island to meet our skiff and driver. The weather was cloudy with a few drizzles, but it wasn’t too bad. At least it wasn’t broiling hot with a ton of bugs. 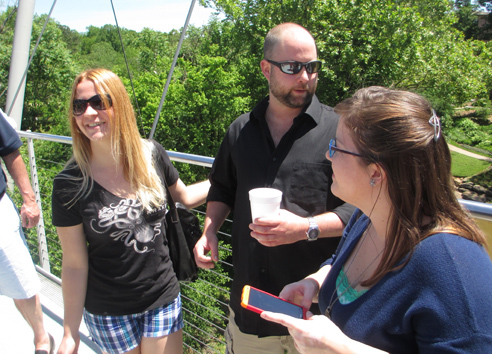 Our guests seemed to enjoy it. We saw nest with some juvenile osprey, a good size pod of dolphins feeding and more bits of nature on the island. 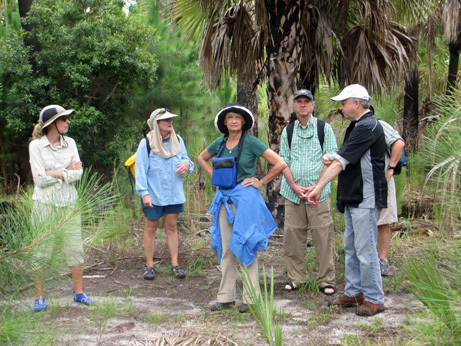 Our guide, Dorothy, in the weird hat and blue shirt, explains some of the island ecosystem. We did have the whole beach to ourselves. I was home by 4 pm and fairly tired. Today I got the back yard and pool cleaned up and checked on my garden. I’m really happy with the way it is growing. 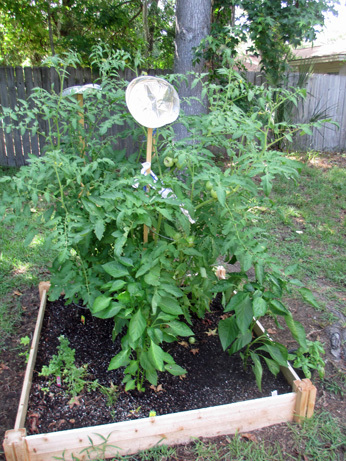 After two previous unsuccessful efforts at growing tomatoes over the past several years, this little 4’x4’ plot seems to be doing well. 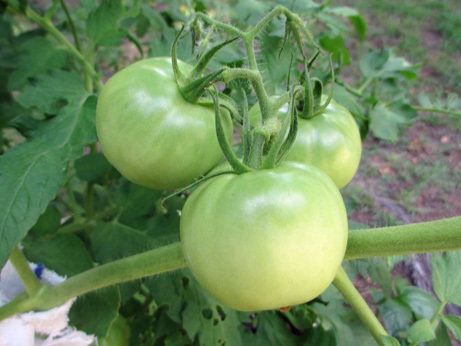 Right now, we have more than 30 tomatoes in some form or another. None have turned red yet, but we are cautiously optimistic. Hopefully these little fellas will turn red. We also have two pepper plants that seem to be doing well. I’m really excited about tasting the first batch. Back to work tomorrow. Sigh. This working out to be a very good week. Ran a couple of errands on the island and then took a nice afternoon nap. Sigh. It clouded up and got windy late in the afternoon. 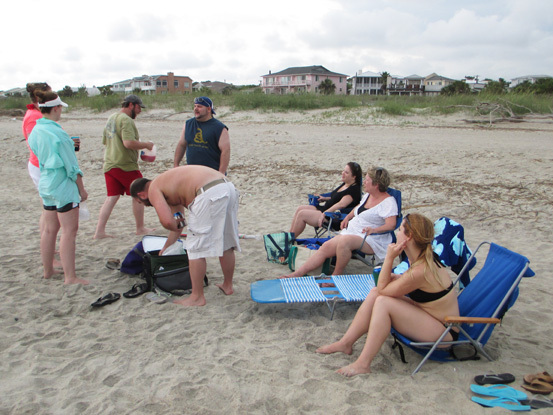 Some of our group hung out on the beach anyway. Even a cloudy day at the beach beats a sunny day behind a desk. We had several of our friends from “down the beach” here for drinks and appetizers that evolved into a full-evening social event. 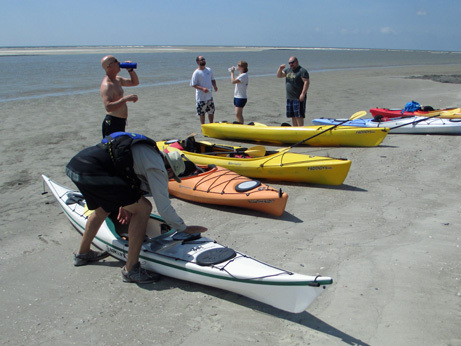 Today, SIL, Poolboy, Girlfriend and I went on a kayak eco-tour. Getting ready to push off on the great adventure. Resting up and re-hydrating on our mid-tour beach break. It was fun, but not quite what we expected. A lot of fairly open-water paddling with a fairly strong wind pushing us around. We did have some nice beach time and saw a few interesting sights, like osprey diving and feeding, and a small bonnet head shark feeding along the shoreline. By the end of our trip, we were pooped. I may not be able to move tomorrow. Another afternoon nap (I could get used this.) and then we all went out to the North Beach Grill for dinner. 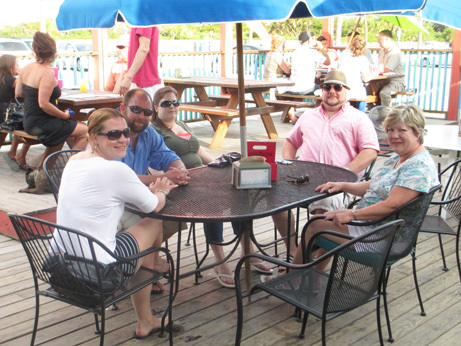 This locally-famous restaurant is really just a beach shack with some outdoor seating on a deck. Our group at the North Beach Grill. The kitchen was slow, but the food was good. I had a jerk chicken sandwich and home-cut fries. 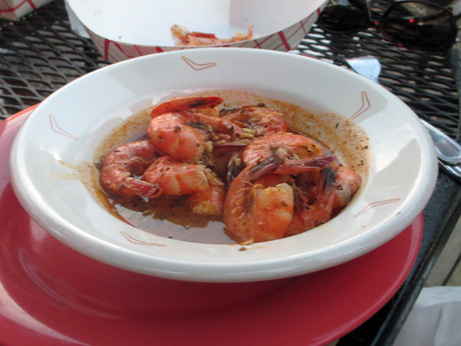 Mrs. P and several of the rest of our group had the half-pound of shrimp, saute’d in a jerk seasoning. It was very good. I think we are going to try to duplicate it at home. Saute’d shrimp in jerk seasoning. I think we are all pretty tired tonight. I don’t see a party night in the offing. Altogether a great weekend, with more to come. Mrs. Poolman and I are officially on vacation. 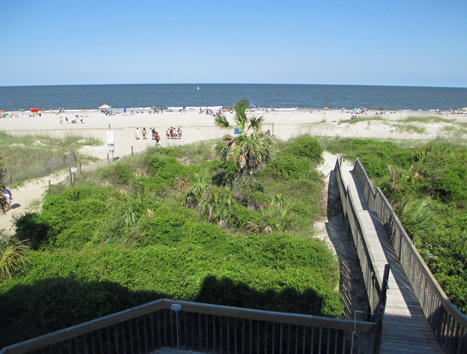 We haven’t gone far, just about 12 miles down the road to Tybee Island where we rented a 3-br beachfront condo. We decided to stay close to home so our children (Poolboy and Writer Princess) along with their significant (Girlfriend and Son-in-law aka SIL) others could join us as much as possible. We got out early Saturday afternoon and spent the rest of the day hanging on our balcony and enjoying life. Our friends, the W’s, came down for a few hours. Also, a family that includes both our and our children’s friends (three generations) is renting a house a few blocks down the beach. Several of them stopped by to visit. Our condo, from the balcony. The view from our deck. 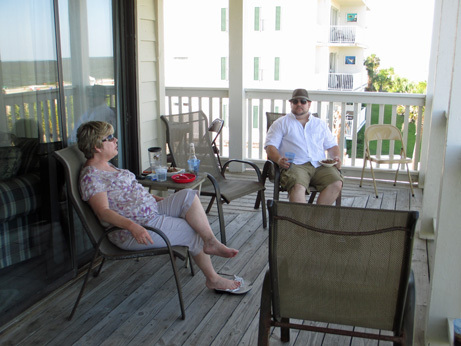 Mrs. Poolman and Son-in-law relaxing on the deck. 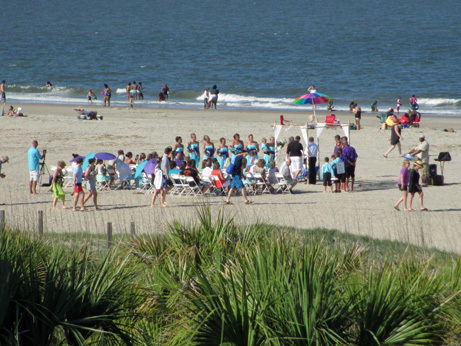 We witnessed a couple of beach weddings from our balcony Saturday afternoon. I guess that can be romantic if you don’t mind every-day beach goers wandering by with their boogie boards and umbrellas during the ceremony. A beach wedding, with guests, both invited and univited. After a morning beach walk, we spent much of the afternoon sitting on the beach and watching the waves. Not a bad day at all. The view from my beach chair this afternoon. I was up and out dark and early this morning. Early rising has never been one of my strong points. 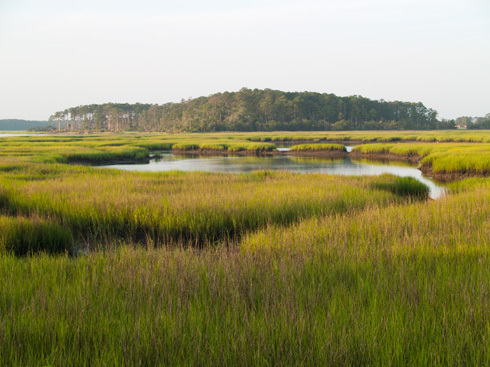 My purpose was to be in place to take a salt marsh photo just after sunrise. Our graphics director had asked me for my help on a brochure she is producing. We had some heavy rain last night so I was a little concerned about the weather. But when the alarm went off at 5:00, I looked outside and saw stars in the sky, so I hoped for the best. I was in place on the Diamond Causeway at 6:10 a.m. and waited for the sun to rise and the light to spill over into the salt marsh. Here is the resulting picture. It isn’t art, but I’m pretty happy with it. 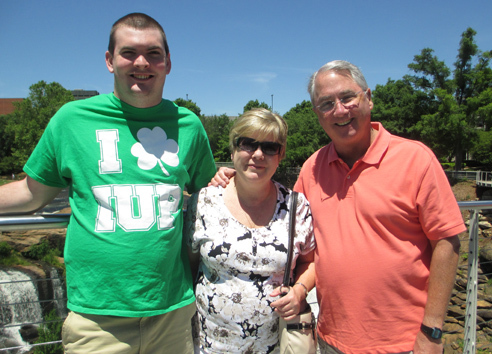 We had a great time over Memorial Day weekend. (Yes, I am a little late catching up.) Our neice, Ellen, got married in Greenville, South Carolina. She is my middle sister’s daughter, so the event attracted a large number of my side of the family. I am the oldest of five. All are married, most with grown, or nearly grown, children. We and our cousins are spread all over the eastern half of the country. It’s been this way ever since I first moved away from Pittsburgh to Florida in 1971. While we are not geographically so close that we can call and say “Come on over for Sunday dinner,” we do have a good time when we do get together. 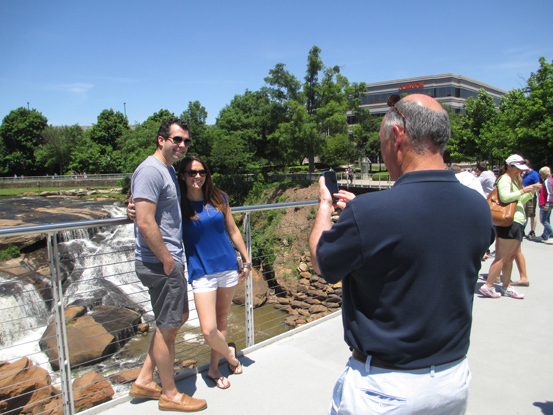 Brother taking picture of his son and daughter-in-law. The rest of downtown is nicely landscaped, pedestrian friendly, and full of shops and restaurants. We went sightseeing both Friday and Saturday afternoon. We had a very nice time. 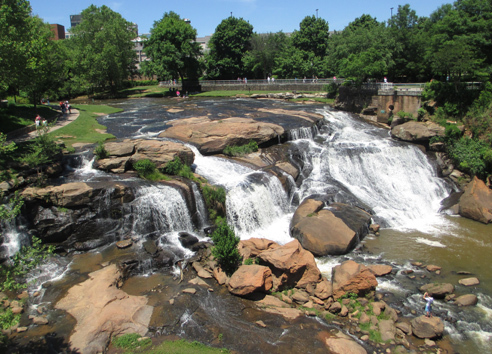 Greenville, South Carolina! Who ‘da thought? 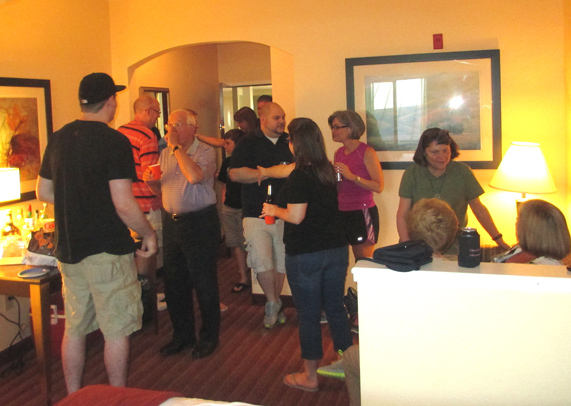 In between the scheduled functions and parties, our family had a fairly non-stop party going back at the hotel. We were all in a Holiday Inn Express. 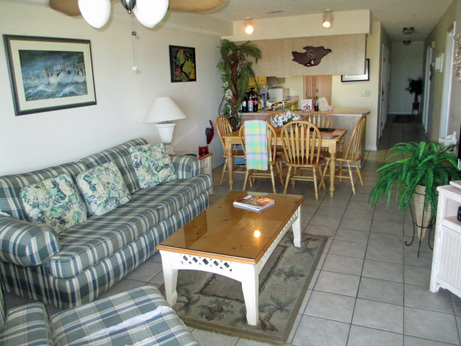 At almost any time you could wander through the lobby and find someone to visit with. Lots of fun and laughter, and a fair amount of ethanol. If not in the lobby, my brother and sister-in-law’s room works just fine. I guess I should show at least one picture of the couple. 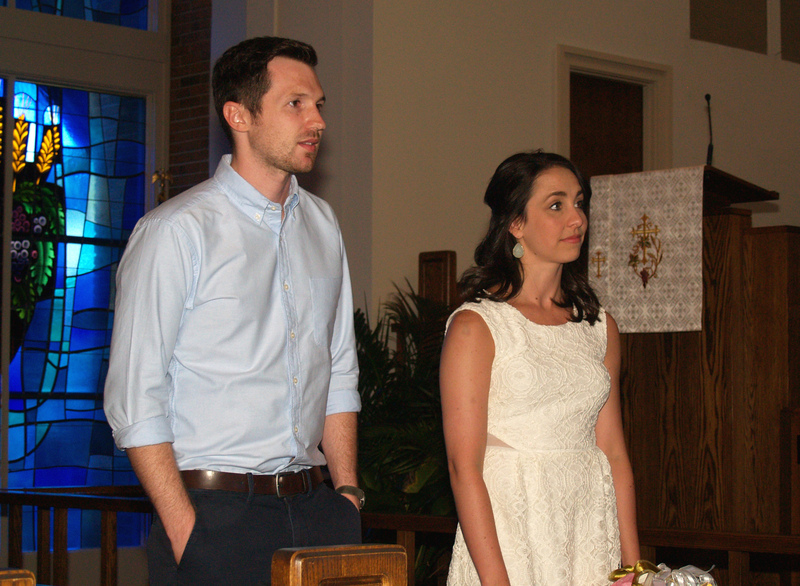 Here is Stan and Ellen, zoning out at the rehearsal.